Having a well-kept lawn is a lovely addition to any home, but it can be difficult to maintain and lawn mowers can often be expensive pieces of kit. Thankfully, Lawn Mowers offers can get you great deals on a wide range of lawn mowers from ride-on to roller mowers and more. As well as bargain lawn mowers they also stock a selection of gardening accessories – so you can get the lawn you want without spending a fortune. Established in 1990, Lawn Mowers is part of Cheltenham Mowers Ltd., a family-run business with many years' experience in the lawn mower industry. In 2000, they launched their successful online arm and have continued to provide expert advice and quality products to satisfied customers around the country. With a company background in all aspects of the lawn mower and garden accessories trade including selling, servicing and repairing lawn mowers, mowers, garden tractors, lawn tractors, brush cutters, hedge trimmers, chainsaws, garden vacuums, garden shredders and all other types of garden machinery, Lawn Mowers are your one-stop shop for all your gardening needs. At Lawn Mowers' comprehensive online store customers can browse a fantastic range of garden machinery, all at competitive prices and offering the very highest standards of quality and reliability. Got a large plot of land to keep trim and tidy? Why not consider the ease and convenience of a ride-on lawn mower or garden tractor? There's a wide choice available, from grass collecting and mulching tractors to four wheel drive lawn mowers, so you're sure to find the right product to suit your needs. Or perhaps you just have a small lawn and want a compact mower that does the job without taking up too much space? At Lawn Mowers you'll find a great selection, whether you want an economical electric mower or a petrol model for something with a little more power. As well as lawn mowers the company also stocks a broad range of garden machinery designed to minimise the amount of time you spend labouring in your garden and maximise the amount of time you can spend relaxing and enjoying the space. From cordless hedge trimmers and and lawn edgers to chain saws, log cutters and more, there's something to suit every garden. And with free delivery to the UK mainland for all orders, it's easy to get all the kit you need delivered straight to your door. Want to get shopping with Lawn Mowers? With Lawn Mowers offers you can get fantastic deals on their wide range of garden machinery and accessories. So whether you're a passionate gardener wanting the very best kit or a beginner looking for your first lawn mower, Lawn Mowers offers the best choice at the best prices. To get your bargain lawn mowers, browse our website until you find a promotional code that suits you then navigate to their website to begin shopping. Enter your Lawn Mowers offers in the box provided. If you've enjoyed shopping with Lawn Mowers, you might also like to check out more great deals on garden equipment at stores like B&Q and Homebase. Or, if those aren't up your street, you'll find plenty more deals to browse in our Home and Garden section. Fill in your address details and click 'Next'. Choose your payment method and click 'Next'. Lawn Mowers free shipping is available to all mainland UK addresses. Need to contact the team at Lawn Mowers? Whether you have a question about your order, want some expert advice on choosing the best garden machinery to suit your needs or simply want to find out more about saving money with Lawn Mowers offers, you can contact the Customer Services department by telephoning 01452 616169. Want to find out more about getting your dream garden with Lawn Mowers? The company maintains a profile across all your favourite social media websites. Follow them for lots of exclusive content including competitions, promotions, gardening tips and tricks and more. You can also use these pages to find out more about saving money with Lawn Mowers offers. Don’t forget to check them regularly, as you can never be sure when free Lawn Mowers offers might be waiting for you! 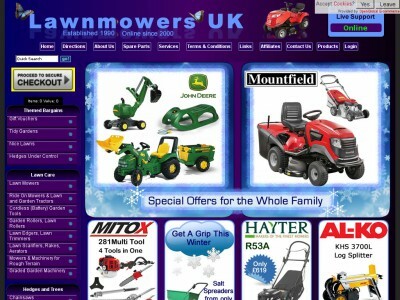 Buy now online at www.lawnmowers-uk.co.uk. When my husband and I bought our first home, it came with quite a large lawn – but lawn mowers were unbelievably expensive! Luckily we were able to get bargain lawn mowers with the discount code I found online. Lawn Mowers offers a wide range of mowers and garden machinery at lawnmowers-uk.co.uk – all available at a great price. I used my Lawn Mowers offers to get a great deal on a convenient petrol powered mower that keeps our lawn in top shape. So why not see what bargain lawn mowers you can find online?